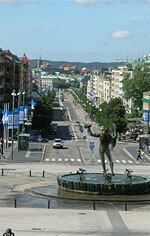 Poseidon in Gothenburg - The Statue at the top of the famous street Avenyn. 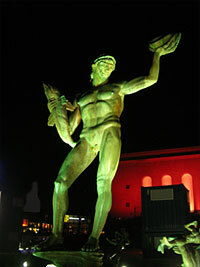 At the top of Avenyn at Götaplatsen you will find him standing naked with a little shy glance watching downwards, Gothenburg´s Poseidon. When Poseidon were ready at Götaplatsen people thought it was a little bit embarrassing that he was naked.....but today we do even think about it. Yes, our acceptance really change through time. 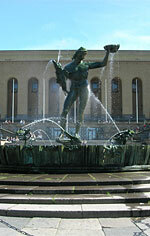 In the greek mythology, Poseidon was the God of the Sea and were doesn´t he fit the best if not in the city of Gothenburg. Sailors often worship Poseidon about getting a calm sea. But before the exhibition it was no time to build or do something else, so a temporary water tub was built in wood. The tub that stands there today were not at place before many years later, 1927. Along the side of the tub you can see shapes of fishes and other water figures. When did Poseidon arrive at Götaplatsen ? 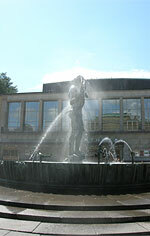 Poseidon by Carl Milles was put in the tub 1931. He is 22 feet high and the tub around him is 3 feet high. Apart from Poseidon you can at least see 6 figures more in the tub. Poseidon is poured at Herman Bergmans firm. Around Poseidon you have many more interesting buildnings in Gothenburg as: Stadsteatern, Konstmuseet, Konserthuset and Konsthallen. At the Summer time you can see all the students take a dip in the tub celebrating that school is "out".